Bob and Anne Payne live at Carr Head Farm and own the Handbank flock of pedigree Texels, which was founded in 1982. We have about 70 breeding females, plus their followers.Our farm lies to the north of Sheffield, between Stocksbridge and Penistone, and we are situated in the Little Don Valley. The edge of the Peak District National Park is across the valley, and our farm falls within the LFA. 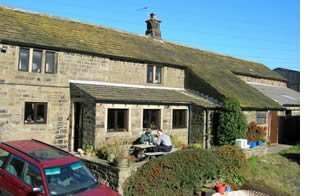 Our stock is reared at an altitude of 800-1000 feet above sea level and the farm is set on west-facing slopes within sight of Underbank Reservoir. It is a beautiful location, but can be a bit wild and feel exposed in the winter-time. For over 20 years, we have been committed to performance recording as a reliable method of producing breeding stock for commercial farmers who are intent on supplying quality lambs which will meet the required industry specification for fat depth and conformation. We have also taken selected ram lambs to the CT Scanner in Edinburgh to give a more accurate indication of gigot muscularity. Our flock has been recorded with Signet---and before that with MLC---for over twenty years. This has involved a programme which records birth weights, 8-week weights, and at 21 weeks all lambs are not only weighed but also scanned ultra-sonically to measure muscle depth and fat depth. By using a combination of reference sires, AI and natural service, our flock is well-connected with other recorded Texel flocks and we have a high level of accuracy. In recent years, we have produced a ram which has gone on to be selected as a Reference Sire within the Texel recording scheme.